The American Film Institute in Los Angeles conducted their seventh polling, 100 Years...100 Songs that highlighted "America's Greatest Music in the Movies." AFI's 100 Years...100 Songs revealed the 100 greatest songs in American films, as chosen by leaders of the entertainment community, in a three-hour television event, that aired on the CBS Television Network in June 2004. 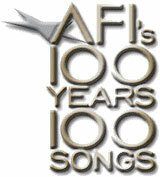 See also AFI's 100 Years of Film Scores. A ballot was distributed in 2003 with 400 nominated films and songs to a jury of 1,500 leaders from the film community, including film artists (directors, screenwriters, actors, editors, composers, cinematographers, etc.) critics and historians. Song - Music and lyrics (that must be part of the film) featured in an American film that set a tone of mood, define character, advance plot and/or express the film's themes in a manner that elevates the moving image art form. Songs may have been written and/or recorded specifically for the film or previously written and/or recorded and selected by the filmmaker to achieve the above goals. Cultural Impact - Songs that have captured the nation's heart, echoed beyond the walls of a movie theater and, ultimately, stand in our collective memory for the film itself. Legacy - Songs that resonate across the century, enriching America's film heritage and captivating artists and audiences today. Tunes with no lyrics -- "The Colonel Bogey March" from The Bridge on the River Kwai (1957), and the themes from Gone With the Wind (1939), Doctor Zhivago (1965), and The Godfather (1972) were not eligible. Film scores were not eligible. "Laura" - the theme from the Oscar-nominated drama of the same name Laura (1944), "A Summer's Place" and [The Theme from] "Picnic" were not eligible because the lyrics did not appear in the film and were written for the song after the film's release. For clarification's sake, a song need not have been written especially for a movie to be eligible. Bob Seger's "Old Time Rock and Roll" was eligible even though it was not written specifically for the film Risky Business (1983). Animated films (or puppet films, such as the Muppets) with songs/dances, and dance sequences with memorable music, such as the iconic Bee Gee's songs in Saturday Night Fever (1977) and Flashdance - What A Feeling in Flashdance (1983) were exceptions to the general rule. There were no Beatles songs among the nominees -- and obviously, in the winners list. Was this because the films were not American-made and therefore ineligible? "Puttin' On The Ritz" at # 89 was attributed to Young Frankenstein (1974), but was originally sung in Blue Skies (1946). Songs from Frank Sinatra or from the documentary film Woodstock (1970) did not make the cut to be in the top 100. Although "That's Entertainment" from The Band Wagon (1953) ranked at # 45, nominee "There's No Business Like Show Business" from Annie Get Your Gun (1950) didn't make the cut.